Paddy Power Betfair has significantly boosted marketing spend after creating one of the biggest gambling companies following the merger of the two brands this year. In its half-year results to the end of June, published today, the company revealed it had upped marketing spend by 31%, or £37m. That led to operating losses in the group’s sales and marketing of £156m, down from £119m over the same period in 2015. Paddy Power and Betfair completed their merger on 2 February. Chief executive Breon Corcoran revealed a marketing budget of £300m for 2016 and said the combined "firepower" would allow the company to focus on key ad slots and sponsorships. Paddy Power Betfair is now the second largest advertiser on Sky Sports after Unilever, and has bought the priciest ad package on BT Sport, according to Corcoran. It has upped its share of voice in gambling TV ads, claiming a jump from 24% in August-September last year to 30% this year. Betfair launched its first ad campaign with Lucky Generals at the beginning of August. On the premium sponsorships front, the Betfair brand is also an FC Barcelona sponsorship as of July. "There continue to be good assets that we don’t own, and there are other operators who challenge us on that," said Corcoran of the brand’s sponsorships. "We’re now the go-to guys when people think about multi-year partnerships for premium assets." It is possible Corcoran was hinting at a high-end sponsorship for Paddy Power, which does not have a major team on its roster. Marketing budget has been freed up, Corcoran said, by each brand sharing their skills and media assets. In one instance, Betfair could not afford to buy standalone Channel 4 racing slots. Instead it used ad slots originally bought by Paddy Power to reach a new audience, Corcoran said. He also described how one brand had better proprietary paid search systems, which was now being rolled out across the other. Similarly, where one brand was better on CRM and ad serving technologies, this was rolled out across both brands. Paddy Power Betfair is also using its combined customer data and analytics to get a better view of the overall market, particularly during "noisy" events such as the Olympics. This has led to improved econometric modelling and A/B testing, Corcoran said. Corcoran emphasised that Paddy Power and Betfair would remain distinct brands in the UK, though internationally, Betfair will take the lead. He outlined three customer segmentation types across both brands, noting that there was little overlap. Betfair customers tend to be "money-centric", focusing on the best odds, and the site’s reliability. They were also more interested in football and racing bets. Paddy Power’s customers were described as "thrill-seekers" and "social", seeking the best entertainment, ease-of-use and with more emotional attachment to the brand. Corcoran said that only 9% of the brand’s UK customer base used both Paddy Power and Betfair in 2015. "It’s encouraging in terms of the opportunity we have to play for," he said. Other marketing savings came from procurement, Corcoran said, including agencies, gaming content and digital marketing. 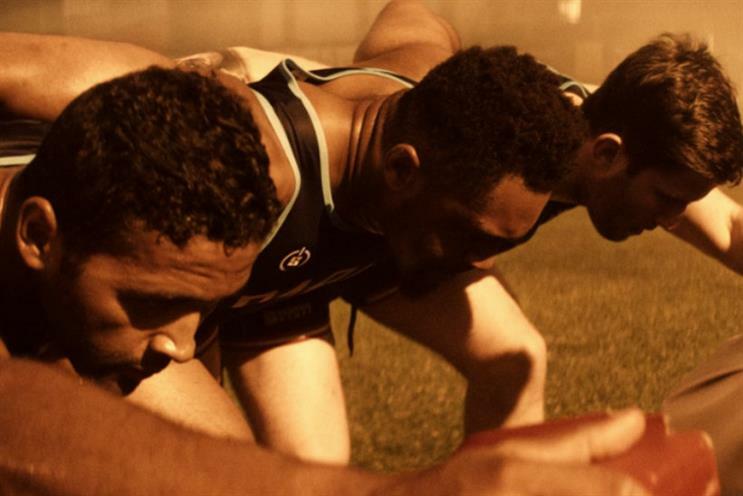 Paddy Power Betfair consolidated its agencies earlier this year, handing media to Betfair incumbent MediaCom, and advertising to Paddy Power incumbent Lucky Generals. 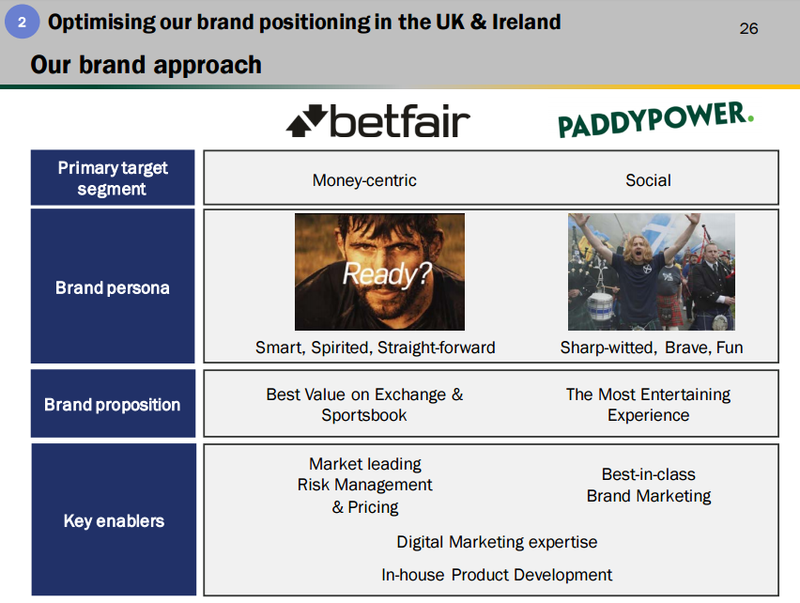 Paddy Power Betfair also combined its CMO roles, leading to the departure of Paddy Power CMO Gav Thompson. He was replaced by Jonathan Devitt. The combined entity also axed a number of jobs in its marketing department after Thompson's departure, mostly affecting Paddy Power staff. The £195m merger pushed Paddy Power Betfair into the red, with the company reporting a £49.3m pre-tax loss for the period, down from a profit of £106.2m last year. It reported an 18% year on year jump in revenue to £759m.